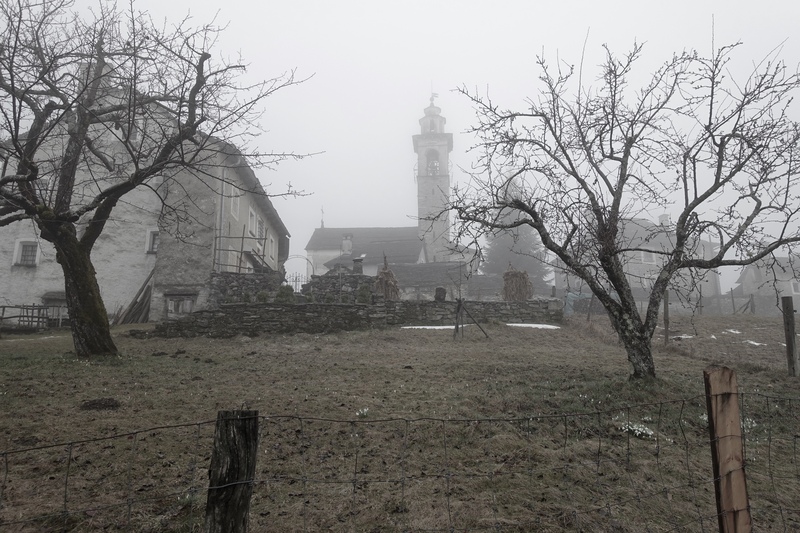 According to myswitzerland.com, Rasa is one of the villages „that enchant the visitor with their simple and authentic beauty“. After today’s hike, I do not only agree but I would also like to add mystical to this attribute list. First, when taking the train from Locarno, make sure that you press the „Stop“ button at the right time; best would be before you arrive in Verdasio, base station of Rasa. Otherwise you miss the place easily. Second, go straight to the Funivia where the cable car to Rasa takes off. Buy your ticket (and make sure that you take it with you) and just sit into the gondola, even when there is no one around. Do neither worry nor panic! With the help of a video camera the engine driver in Rasa controls the gondola including the ‚automatic‘ closure of the door. It is still something special to be in your small gondola alone, with a 500ft valley below you. Third, Rasa itself is a mystical place. With all the fog and the drizzling rain, with old stone buildings (incl. a nice cathedral with a wrong setting clock) and with a few but somehow special people* a wildish and medieval feeling is created easily – although the place might be quite neat, welcoming and also much more crowded in sunny conditions. From Rasa, there are severals hikes possible. 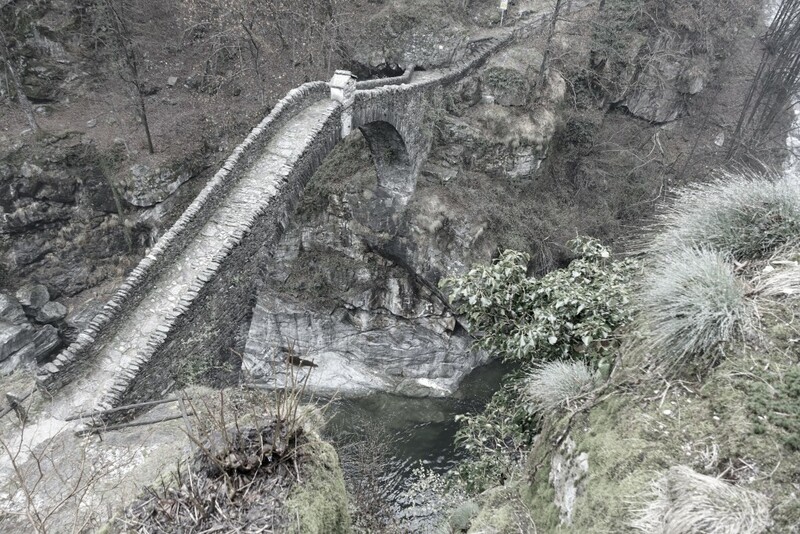 We decided for today to take the simple route back down to Intragna, passing farms with crossing sheep, steep downhill trails and the nice and old Ponte Romanum (ca. 2hrs). The final lunch at Grotto du Rii makes this mystical but really enjoyable hiking tour very round. 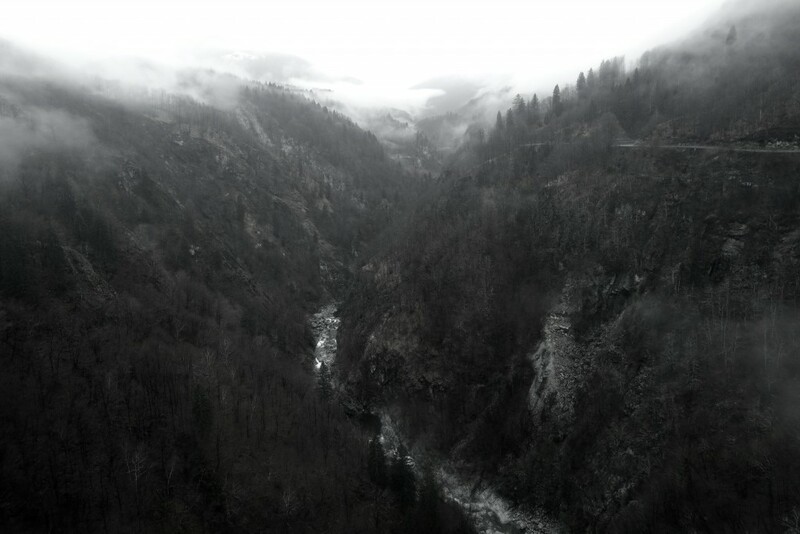 * The two persons we met were the cable car driver sitting in his lonely control room (incl. a video camera showing the base station) and a person who just came out of his building to ring the cathedral bells at 11am. Hint: To all mountain runners, it is definitely worth to run uphill the other way around – but maybe choose a day with better and drier weather conditions (stones are quite slippery when wet). Frühling im Tessin – blühende Forsythien und Kamelien, mediterrane Atmosphäre und Palmen, blauer Himmel und strahlende Sonne. Sehr gute Gründe für einen Kurzurlaub in der italienischen Schweiz. Letzterer Aspekt trifft für die diesjährige Nachosterwoche leider nicht zu. Dafür gab es tiefhängende Wolken mit leichtem bis mittleren Regen. Die Entscheidung für einen ersten bergigen Lauf am Mittwochnachmittag war dennoch vollkommen richtig. Die Hänge oberhalb Locarnos bekommen im Nebel einen mystischen Hauch. Die frische und feuchte Luft sowie der Duft der blühenden Pflanzen ist Balsam für jede Nase. 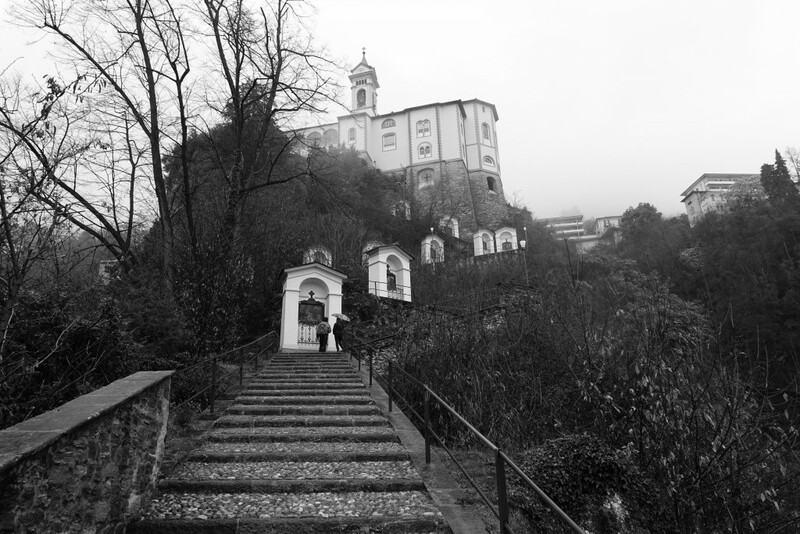 Und die vielen Treppen (u. a. zur Madonna del Sasso) und abwechslungsreichen Trails lassen jedes Läuferherz höher schlagen. Hinweis: Der Titel ‚Trails & Stairs‘ lehnt sich an das bekannte Musikfestival ‚Moon and Stars‘ von Locarno an, welches jährlich im Sommermonat Juli stattfindet. Vielleicht ein guter Grund wiederzukommen. Sunrise at the top of Uetliberg (ZH). Combined with loads of snow. Breathing out in the freezing air. – This was one vision I had when starting this blog. But the above-mentioned scenario is depending on many criteria (having time, feeling fit, weather conditions, snow conditions, etc.) and I still could not manage to fulfil this dream so far. It even seems that it will not happen this winter at all since snow got quite rare at Uetliberg, temperature is rising and days beginn earlier and earlier. However, this Sunday I changed the idea of my vision slightly and made an amazing experience. Instead of running up to Uetliberg and down again, I took the mountain bike (which is faster and makes me less tired for tennis training afterwards). First outdoor ride this year, -2C°, sunrise before the climb, and blue sky on top. Video is on top, photoshot see below, and results are here. 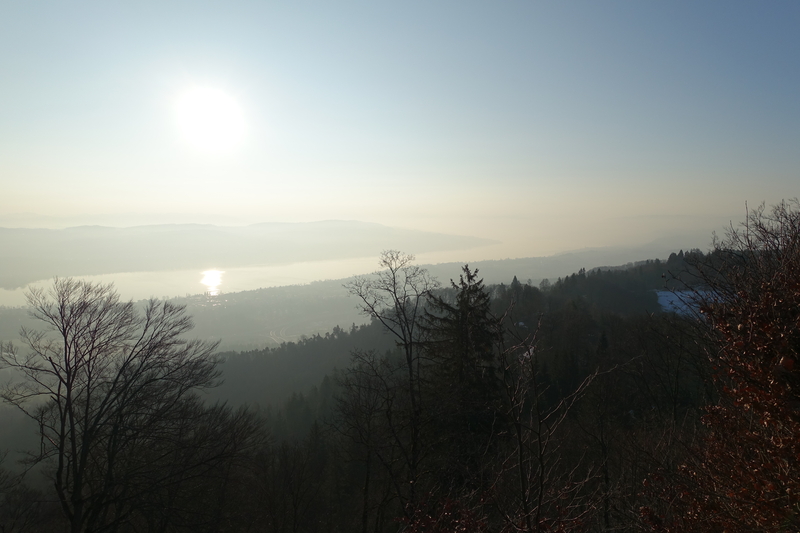 Nice atmosphere on top of Uetliberg at 7.30am.